Never give up just as our saviour the lord Jesus Christ never gave up. 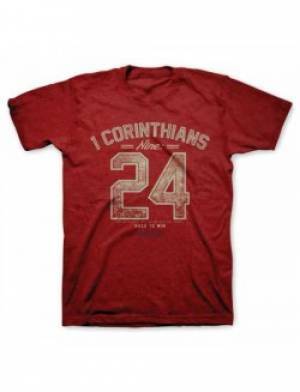 A royal red coloured t-shirt that shows the writing '1 Corinthians Nine 24' in faded white characters. "Do you not know that in a race all the runners run, but only one gets the prize? Run in such a way as to get the prize." -1 Corinthians 9:24. Nine 24 T Shirt: Adult Small was published by Kerusso in April 2016 and is our 43634th best seller. The ISBN for Nine 24 T Shirt: Adult Small is 612978272282. Be the first to review Nine 24 T Shirt: Adult Small! Got a question? No problem! Just click here to ask us about Nine 24 T Shirt: Adult Small.